With immense grief and unparalleled sadness we inform that our beloved Founder Chairman Shri Bhavarlal Hiralal Jain (Age 79) passed away on 25th February 2016, after a brief illness at a hospital in Mumbai. He was a man of small ideas which created big revolutions. He practiced what he preached and he built his entire business on a foundation of inclusiveness and sustainability over the last five decades. He believed small farmers are entrepreneurs and they must get dignity as well as higher income. He toiled hard to ensure the same to over 5 million farmers. He was a visionary and "Karmayogi". We pledge to walk on the path envisioned by him forever. The small town entrepreneur who established a billion dollar, rural, multinational corporation. A spirited champion of the small farmer; whom he saw as nobly toiling in the face of all adversity. A committed environmentalist and compassionate social worker - is no more! How can mere words describe this multifaceted man? A son of the soil, who by sheer dint of hard work, bravely facing penury, rose to head the world’s second largest drip irrigation company. Whose pioneering work in the farming sector is unparalleled by any single individual in this country’s history. Who brought the latest and most relevant technology to the small and marginal farmers and always ensured that all his business was done ethically and with a conscience. That whatever technology was brought, could be adapted for small farm holdings. Further, he constantly innovated with these technologies to make them affordable and within their reach. His diminutive stature belied the immense reserves of strength that the man had. Seven heart attacks, two bypass surgeries, an angioplasty and cerebral stroke did not deter him from working an eight or ten hour day. Be it building and running of the Anubhuti School or the mammoth Gandhi Research Foundation. The latter he set up not just because he personally believed in the Mahatma’s teachings but also to ensure that the younger generation never forgets him or the timeless message of his life’s work. A much sought after public speaker, he would hold his audience spellbound with his knowledge & eloquence on various subjects - be they work related, political or social. Without as much as a scrap of paper as an aide memoire, his prodigious memory could recall data, events or recount anecdotes and stories to enthrall, entertain or captivate his audiences. There were so many subjects that he was committed to that he has written several books on them. His book on the ills of social structure written 20 years ago is as relevant today as it was then. His book on his experiments and learnings with watershed management could well be used as a textbook by students and by the general public as the subject is so pertinent and his observations so simple to understand. His unique style of management has a thriving sustainable corporation, employing 10,000 associates, seamlessly working across five continents. This is reflected in his books - "An Entrepreneur Deciphered" & "The Enlightened Entrepreneur". Perhaps the most touching story "Tee ani Mee", written in Marathi, Hindi & English on the relationship with his wife, stops from being just a charming sentimental account of his life with her, because of the underlying message that is woven skillfully into the narrative. A message of direction, a message of hope & encouragement to young couples entering matrimony. The book is in its third edition and has sold more than 1,20,000 copies in a few years. 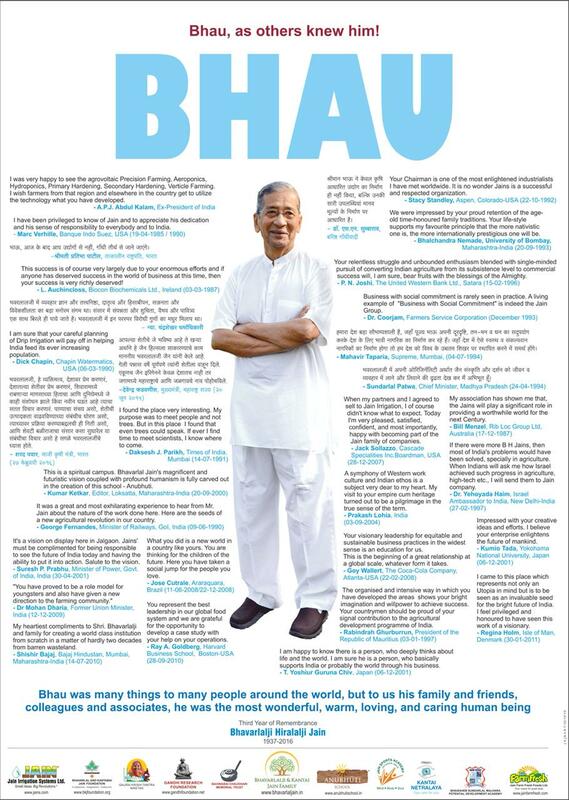 Bhau’s unflagging energy has always amazed his younger colleagues and contemporaries. He was ever ready to adopt new technologies and enter new ventures. Particularly ventures that had a social impact and would benefit society. It was his company’s avowed policy to never get into any business that preyed upon the weaknesses or addictions of others. No matter how profitable they may be! Thus there was always an effort to do business that would have a positive impact on society - particularly the weaker sections of society. His work & concern for the environment had its roots in the tenets of Jainism, which teaches one to protect and live in tune with nature. His herculean task of transforming Jain Hills and its environs into a fertile green paradise included planting millions of trees. Trees that were not just planted and abandoned to fend for them, but watered, nurtured and cared for. These efforts converted tracts of barren land into swathes of green and brought hectares of arid fallow land under cultivation. Bhau’s sterling work on rainwater harvesting, watershed management and conservation is a landmark in the history of agriculture in this arid region of Khandesh. This and his contribution to agriculture have led universities to bestow four honorary doctorates and have won him numerous national and international awards. The prestigious Crawford Reid Award for promoting proper irrigation techniques has been given to only two Asians till date. More recently the nation recognized his work and awarded him the Padma Shri in 2008. He set up a huge Agri-Institute at Jain Hills with a faculty of agronomists and doctorates to train farmers from all over India and abroad on the latest farming methods. As we bid farewell to this towering visionary, our hearts are gladdened with the thought that even if he is no more with us, we inherit his legacy of tireless work and love for the environment, which he has planted in each and every one of us. अजित जैन, जैन इरिगेशन सिस्टम लि. Watching the Republic Day Parade this morning. The beauty of India’s rich and diverse cultures is visible in one place in all its splendor in the colorful pageantry of the human kaleidoscope that is this spectacle. As I continue to explore this amazing land, there is unmatched beauty to be found in its people and their traditional performing arts of classical music and dance, magnificent historic monuments, revered places of worship, gorgeous national parks and their varied flora and fauna and, of course, in the country’s incomparable gastronomic delights. And then there is the advent of technology visible in the ubiquitous mobile phones and IT parks, space missions and, certainly in the continued promise of the demographic dividend that is expected from its population more than half of which is below the age of thirty. And yet, despite all this, India is and remains an essentially agrarian society with more than seventy percent of its population living in rural areas and engaged in agricultural activities. Happily, great things are happening in India in this most important part of the national economy thanks to the imagination and pioneering work of visionaries like Padmashree Bhavarlal Jain and his companies in Jalgaon. Last weekend there, I had the opportunity of visiting the Jain Hills, the environment–friendly manufacturing hub and the nerve center of this conglomerate of a variety of high–tech, agri–based industries. Bhavarlal Jain, affectionately known as "Bhau" whose first death anniversary falls on February 25, 2017 was a gifted entrepreneur and the founder chairman of Jain Irrigation Systems, now the second largest micro–irrigation company in the world. This is of great significance. The goal of micro–irrigation is the revolutionary idea of maximizing crop per drop of water and this is of paramount importance in water–starved India. 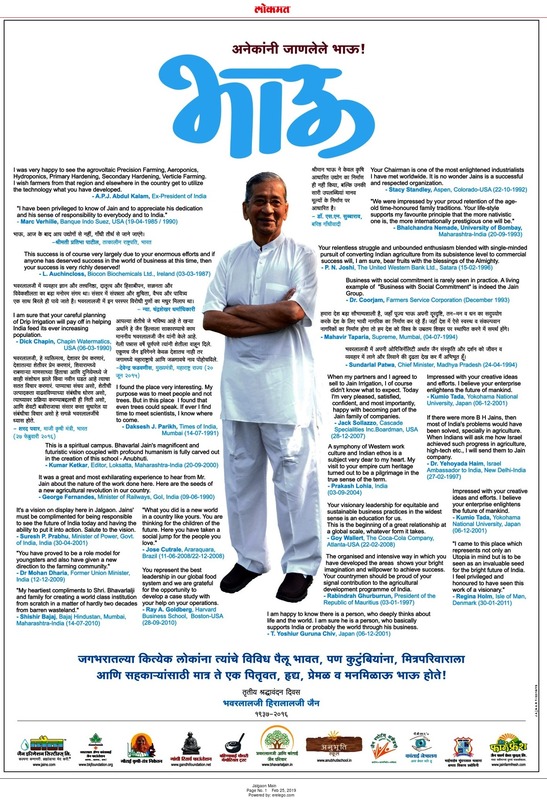 Bhau was a giant among men, a rare human being as a thinker/philosopher, an industrialist, businessman, writer, advocate of the poor, social activist, a staunch Gandhian and a philanthropist. But above all, he was a true son of the soil. He prided in calling himself a farmer and tirelessly dedicated his formidable talents and energies to the education and uplifting of the farming community through innovative technology. Since his sad demise last year, his four very able sons Ashok, Anil, Atul and Ajit are carrying out this mission with great enthusiasm and determination worthy of their illustrious father. 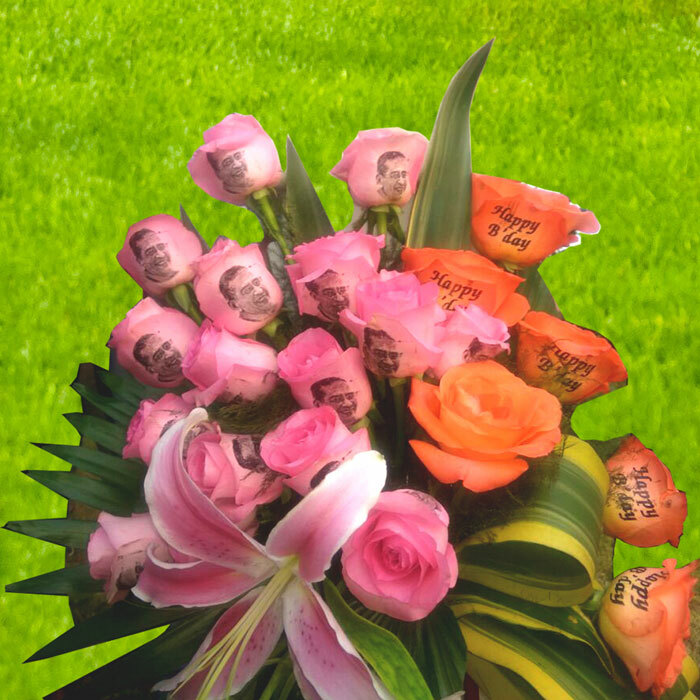 Bhau is aptly recognized as the father of the Second Green Revolution in India. But his life story is an incredible tale of imagination, hard–work and a relentless pursuit of excellence. Starting with humble beginnings in the dry, arid region of impoverished rural Maharashtra, Bhau built an empire of industries that optimize local resources to produce a range of agricultural products providing employment to over 10,000 people all over the world. The products include, just to name a few â€“ plastic pipes and sheets, Drip and Sprinkler irrigation systems, greenhouses, solar pumps, and facilities for tissue culture, hydroponics, food processing and extensive R&D pertaining to these products, all unmistakably related to agriculture . The sprawling complex of the Jain irrigation is spread over an area of about 2000 acres on a hilly area outside the city of Jalgaon. This complex is a spectacularly master–planned township in itself with beautiful residences, offices, manufacturing plants and labs, healthcare, educational and training facilities, farms and gardens, independent utility systems and all necessary infrastructure, all carefully laid out amidst greenery that would be an envy of a verdant tropical forest. Once just barren and essentially worthless hills, this area has now been converted into cultivable land of magnificent orchards and expansive manicured landscapes. This is paradise on earth. Everything is so neat, clean, lush, and top of the line. Once upon a time, comparing the wealthy Western nations in frigid climates with impoverished but sunny India, it was said that: The West is cursed by God and nursed by man. And India is cursed by man and nursed by God. Well, not true anymore. At least not at Jain Hills where there is every evidence of Mother Nature being further nursed by man ever so lovingly. But beyond its success in industry and business, the most impressive and distinguishing aspect of the Jain Group is its focus on the environment, renewable energy, social responsibility and employment of the latest technology wherever possible. The culmination of the sense of social responsibility is evident in the exemplary social projects like the Anubhuti School which is dedicated to creating the leaders of tomorrow, the ultra–modern and essentially cost–free–for–the–needy eye clinic, and the monumental Gandhi Teerth & the Gandhi Research Foundation, undoubtedly the magnum opus of Bhau’s impressive career that spanned half a century. The Gandhi Teerth, employing the latest world–class audio–visual technology is on par with if not better than the finest museums of London and Paris. Beyond its educational value, it is a place for reflection, meditation and worship. And finally, in the making is Bhau’s ultimate dream, the proposed one–of–its–kind University for Advanced Studies in agriculture and water resource management. While much of this great work is happening quietly without fanfare, there is recognition and there are awards galore. Just for example, recently the University of Nebraska, globally renowned for quality education and research, and the Robert B. Daugherty Water for Food Institute honored Bhau for his lifetime achievement. They named their research project as "Bhavarlal Hiralal Jain– University of Nebraska Water for Food Collaborative Program," permanently. He was recognized for "his pioneering efforts starting a new green revolution through his achievements in effective research, sustainable use of natural resources by bringing together farmers, agronomists, scientists, technologists and industrialists for the same noble cause. The scientists joining the university will be honorably called as B. H. Jain Scholars". Clearly, great things are happening even in the hinterlands of India. Companies like the Jain Group are doing transformational work. That is what India needs. India is beautiful once we begin to look beyond the pollution, pot–holes and politicians. कृषी औद्योगिक क्रांतीचे शिल्पकार,शेती शेतकरी यांचा दृष्टां मार्गदर्शक आदरणीय कै.भवरलालजी जैन उर्फ भाऊ स्मृतीदिन,भावपूर्ण आदरांजली !! गांधी तीर्थ एक प्रेरणा स्त्रोत्र एक अखंड ज्योत सतत वाहता झरा गांधी दर्शन व्यापकता कल्पकता प्रतिभा प्रगल्भता प्रज्ञा यांचा संगम भवरलाल जैन यांची निर्मिती योगदान पंण येथे महात्मा कोठे आहे? ना मंदिरात ना सभाग्रहात महात्मा दिसतात जिथे सामान्य बसतात उठतात तिथे बाहेर एक लानवर बसलेले आशा ठिकाणी की प्रत्येक जण थांबतो दर्शन घेतो त्यांच्या भजनात एकरूप होत जातो विकार मुक्त होण्याची शपथ घेतो अन शोधत राहतो बापूजीना सत्त्यात अहिंसेत सेवेत तत्वज्ञानात सुसंस्कारात अन धन्य होतो सहज होतो शिष्य बापूंजींचा यातच अनुभवा येतो भवरलाल जैन यांच्या दुरदृष्टीचा अन गांधीजींच्या महात्म्यातील अमृताचा !! आपण मला दिलेले "ती आणि मी" हे भवरलाल जैन लिखीत पुस्तक आत्ताच 00.25 वाजता वाचून झाले आहे. हे पुस्तक एक आत्मचरित्र आहे. लेखकाने आपल्या सहचरिणीबद्दल लिहिलेली वस्तुस्थिती आहे. पुस्तकातील एक व्यक्तीमत्व कै.सौ.कांताबाई भवरलाल जैन ही माता गेल्यानंतर जैन परीवाराला जे दुःख झाले तेवढेच दुःख माझ्या सारख्या वाचकाला झाले. पुस्तक वाचून झाल्यानंतर अक्षरशः माझ्या डोळ्यांतून पाणी आले. कै.सौ. कांताबाई जैन ह्यांच्या आत्म्याला चिरःशांती लाभो ही परमेश्वर चरणी प्रार्थना. 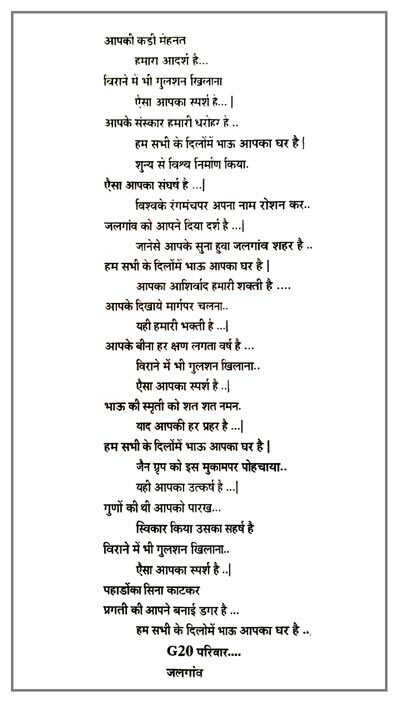 भवरलाल भाऊ हे केवळ उद्योगपती च नाहीत तर खूप चांगले लेखक व साहित्यिक आहेत. माझ्या भावना जैन कुटुंबीयां पर्यंत पोहोचवाव्यात,अशी माझी विनंती आहे. धन्यवाद. Dear sir, Greetings. I was delighted to know that you are recovering fast post-surgery. I along with 50 people including farmers, industrialists and entrepreneurs from Palladam visited the Jain Campus last week. The group was amazed & astonished with the exemplary vision of our very own Bade Bhau, and had a lot of lifetime learnings from the tour of the facility. The group was impressed with the functioning of Anuboodhi school and the way it imparts experiential learning as a part of the curriculum to the students. They were also taken aback with the overall infrastructure and the ambience of the ecosystem, that persists in every part of the organisation. 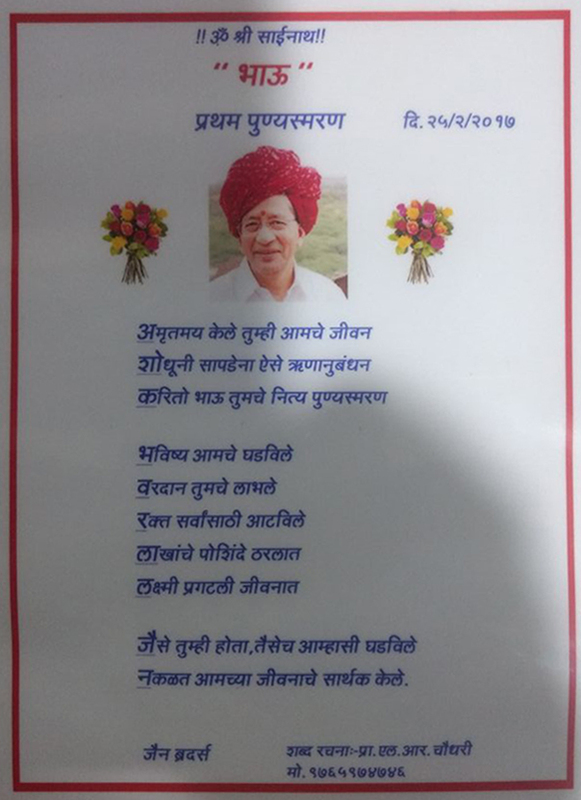 Everybody in the group appreciated the arrangements made, and I am thanking you for giving me this opportunity to taking forward the vision of Bhau to my home-town and even more! कै भवरलाल जैन यांना विनम्र आदरांजली !! तो एक वहाता अमृताचा झरा आकाश सावलीचे विश्व कर्तूत्वाचे पुरस्कार मानवतेचा शिकवण गांधीजीची अहंकार मुक्त सदैव ध्यास पूर्ततेचा असा एक वहाता अमृताचा झरा !! पाणी,वृक्ष फळे पिके यांचा दृष्टा क्रांतिकारी राजदूत तो निसर्ग संवर्धनाचा व्यापले सकल विश्वा!! भाग्य माझे थोर लाभला आशीर्वाद मजला या अमृताचा !! If you Wish to Extend your Tribute by Sharing your Memories, Thoughts & Feelings with our Beloved BadeBhau. एक मूर्ती अनुभूतीची प्रयोगशीलतेची ! सुधीर भोगंळे यांचे मोठ्या भाऊंचे स्मरण दिवसा निमित्त झालेल्या साहित्य संमेलनातील भाषण. Sustainable Agro- commercial Finance Ltd.
Jain Farm Fresh Foods Ltd.